I'm a bit more than mid-way through my first-ever reading of Haldeman's The Forever War. I'm also in the middle of Neal Stephenson's Anathem--the lethal two-books-at-once situation. 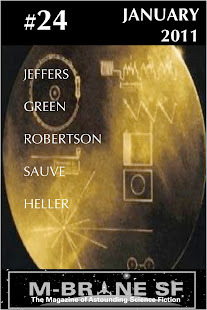 But Haldeman's book is a fast-paced page-turner while Stephenson's is decidedly not, so they fit different reading needs and moods at different times. Haldeman's book is widely regarded as a major classic of both the sf genre and the war novel genre, and I am reading it with special attention to the way combat is depicted and how the off-duty culture of soldiers is handled as compared to some other military sf stories that I was more familiar with. I'm also comparing it a lot with those things in the story I've been writing. I used to mention more often on this blog my novel-in-progress, now code-named Neglected Project. It's set in the pre-history of a far-future milieu that my friend Pat and I co-devised a while ago (the universe of Really Neglected Project). Anyway, I got inspired and started banging it out last summer and it emerged as largely a military sf story--or at least with a lot of the trappings of such being used to convey the main idea. The manuscript now stands at a bit over 60,ooo words and it probably needs another 30-40K to be done. My progress has been very, very slow of late, and I realized that some of what's stalling it is that I haven't been sure how to dig into some of the scenes that still need to be finished or, in some cases, first-drafted. I've had what I felt were a lot of false starts with some the combat sequences that my plot demands occur in some detail and which need to have a real feeling of wild action. But I've been looking back at some scenes in other sf war lit and reading this new-to-me book by Haldeman and glancing over some portions of Neglected Project...and starting to think that maybe I wasn't doing too badly to begin with and just need to revise and polish rather than start over. That's an encouraging way to feel, and it makes me feel like diving back into it. I may even come up with a real title someday. By the way, I first learned of Joe Haldeman when I was kid and read his Star Trek novel WORLD WITHOUT END , from the Bantam series. I picked this up again about a year ago during a particularly bad depressed-can't-read-anything-new, need to occupy with my brain with something really easy phase. I was annoyed to find references to planets with names such as Enid 2 and New Ponca (these are derived from Oklahoma place names). Haldeman was originally from OK, so I get it that he was tipping his hat to his old stomping grounds, but I sure wasn't looking for it right THEN on that day in particular in a Trek novel that I was only reading to force awareness of my surroundings as far away as possible. What kind of a crap-hole of a planet would New Ponca be anyway? (sorry, Ponca City!) So, far, FOREVER WAR has been blessedly free of such references! 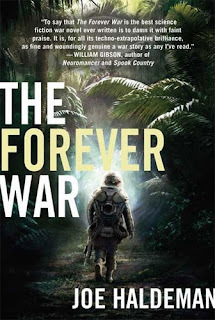 FOREVER WAR is not only an excellent SF novel and a great example of life in the military, but it truly expresses the waste and futility of war. And if you need to read something to get over depression, try the Hitchiker's Guide to the Galaxy novels. It a great five book trilogy. And if you need something that make's even suicidal depression seem like a passing fancy, try the Chronicles of Thomas Covenant (All six books.) Now there's a guy who REALLY understands depression. But it's a great story nonetheless! Right on all counts, Dan. I'm probably going to post something or maybe write something in the zine about FOREVER WAR because it's brought a lot of things to mind. I have read the first 3 of the HITCHHIKER'S series a couple times in my life, but haven't gotten to the last 2 for some reason. Thomas Covenant I have not read, but I'll remember it next time I'm hunting for something.